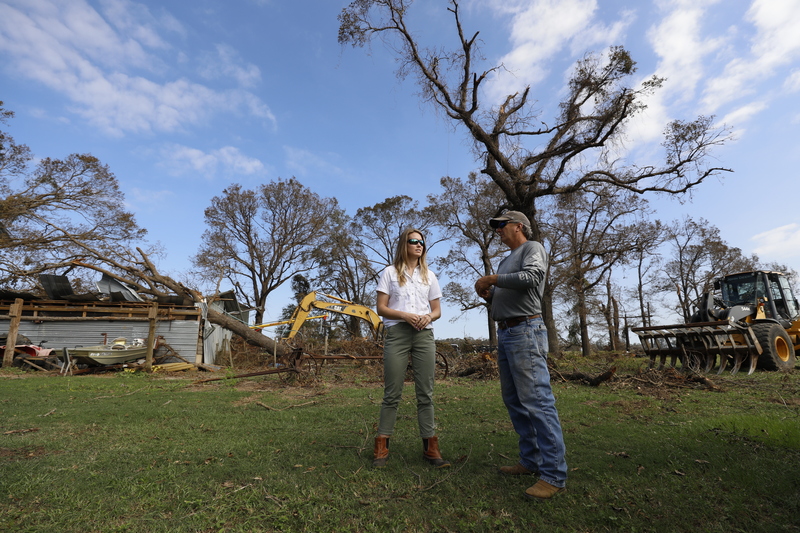 Hurricane Michael blew across southwest Georgia on Oct. 10, causing more than $2 billion in losses to the state’s agriculture industry, according to estimates from University of Georgia Cooperative Extension agricultural economists and Extension agents. The state’s pecan industry suffered a $100 million loss from this year’s crop plus $260 million in lost trees. An additional $200 million in future profits will be lost over the next decade as new orchards are planted and existing orchards are re-established, said Lenny Wells, UGA Extension pecan specialist. Cotton fields that promised near-record harvest were destroyed by the hurricane; some fields in southwest Georgia have been declared a complete loss with all the cotton now blown off the plants and lying on the ground. While farmers in southeast Georgia slipped by with as little as a 15 percent loss, some southwest Georgia farmers are looking at total losses in some fields, he said. The fact that the storm struck when the cotton was near harvest made the impact even more severe. Whitaker estimates that only 15 percent of this year’s crop was already picked before Hurricane Michael arrived, while a small portion of the crop was planted late enough to be relatively safe. Georgia cotton crop loss estimates vary widely, from $550 million to $600 million in lost lint and seed. The loss to Georgia’s peanut crop is estimated to be between $10 million and $20 million. The hurricane dealt a devastating blow to local buying points and peanut shellers when it traveled through Bainbridge, Donalsonville, Camilla, Albany and Cordele, which represent a significant portion of the state’s peanut-producing community. Before the storm, 40 to 45 percent of Georgia’s peanut crop was still in the field. Now growers must harvest the remaining crop without losing too much in weight and quality. Some nuts will be lost due to overmaturity or disease as growers could not dig peanuts due to the storm, said UGA Extension peanut agronomist Scott Monfort. Sweet corn producers, many of whom were in the direct path of the storm, were hardest hit, with losses of up to 100 percent of their remaining crop. In Mitchell and Decatur counties, where the bulk of the state’s fall sweet corn is planted, much of the crop was destroyed, said Timothy Coolong, UGA Extension vegetable horticulture specialist. Because of the long growing season, southwest Georgia farmers are able to produce spring and fall crops of vegetables like tomatoes, sweet corn, eggplants, green beans, peppers, cucumbers and squash. Harvest occurs in June and October for spring and fall crops, respectively. Many of the state’s cool-season vegetables, which were just transplanted, were spared. Although some damage is expected, most of the plants were small enough to be somewhat sheltered from the hurricane’s winds. Georgia’s nursery production industry, which produces trees and ornamental plants for landscapes across the Southeast, suffered $13 million as nurseries in the southwest corner of the state were damaged. The Georgia Forestry Commission reported that the hurricane damaged about 2 million in acres in timberland, valued at $374 million. About 79,000 acres of forestland are a complete loss, according to Georgia Forestry Commissioner Chuck Williams. The poultry industry losses are estimated at $25 million in lost birds and houses. Soybean growers suffered a $10 million to $20 million loss. Livestock and dairy farmers suffered infrastructure losses, like fencing and forage, but UGA Extension economists have no real estimate for livestock losses. Dairy farmers lost milk production due to power outages, which prevented them from milking cows and storing their milk safely.